Does your love of those iconic chocolate sandwich cookies filled with vanilla frosting clash with your health goals? While those highly processed cookies are vegan, they are certainly not good for you. Get the taste you crave with this Vegan Cookies and Cream Shakeology smoothie. 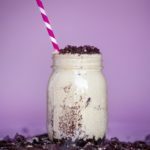 Made with creamy Vanilla Vegan Shakeology and chocolate Graham crackers, you’ll indulge your cookies and cream cravings with a snack that won’t wreck your diet. With this creamy Shakeology smoothie, you'll indulge your cookies and cream cravings with a drink that's actually good for you.